This weekend is a big weekend for US sports, and it seems the biggest action is concentrated in the Dallas-Fort Worth, Texas, area with the NCAA Men’s Basketball Final Four at AT&T Stadium in Dallas, more specifically Arlington, and NASCAR’s Nationwide and Sprint Cup series hitting the track at Texas Motor Speedway near Fort Worth. NASCAR has already seen action, with Chase Elliott claiming his first-career Nationwide win in his sixth series start on Friday night. 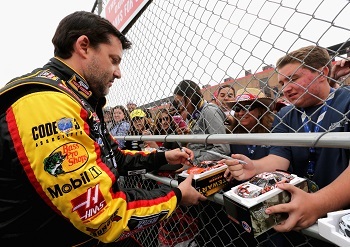 The Sprint Cup Series qualifies on Saturday for Sunday’s Duck Commander 500. That Sprint Cup Series race is sandwiched between two days of Final Four action, with the top-ranked University of Florida Gators getting the round-ball action started with a matchup against the University of Connecticut (a.k.a UConn) Huskies, followed by a game between the University of Kentucky Wildcats and the University of Wisconson Badgers Saturday night; the winners advance to the championship game on Monday night. By the way, I’m a Kentucky native and a life-long Wildcat fan, so you can probably figure out who I’ll be rooting for in regards to the Final Four. But that’s not what I’m supposed to be writing about, here. This is a racing website, and trust me, I’m about to get to the racing part of this blog entry. With this weekend’s NASCAR action being near the NCAA Final Four epicenter, I thought I’d take this opportunity to pick my NASCAR Final Four — my prediction of which four drivers will be racing for the Sprint Cup in Novemeber in the season finale at Homestead-Miami Speedway. Granted, Sunday’s race is only the seventh of 36 points-paying races that make up the 2014 season and seventh of the 26 that make up the “regular” season to determine the participants in the Chase for the Sprint Cup — NASCAR’s version of the NCAA tournament. With the new Chase format, 16 drivers will make the cut, and four will be eliminated after every three races within the 10-race Chase or tourney. Also, winning within each three-race segment of the Chase will automatically advance drivers still in it to the next round. Of course there will be some who advance on points, too. 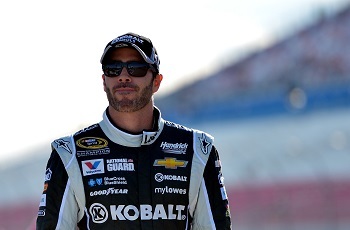 Jimmie Johnson: Seriously, is it ever a good idea to bet against Johnson? He’s the reigning champion, not to mention a six-timer. Maybe he’s the Kentucky of my picks. Okay, so I couldn’t resist bringing up my beloved Cats, again. But Kentucky is the all-time winningest team in college basketball and is in search of a ninth national championship. Meanwhile, Johnson leads the way, at least championship-wise, among active drivers with seven Sprint Cups. It’s hard to bet against a proven winner, even if he still hasn’t won a race yet this year. By the end of the regular season, Johnson’s sure to be a convincing one seed. 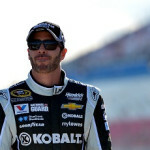 Dale Earnhardt Jr.: Okay, so Earnhardt Jr. isn’t traditionally the proven winner that Johnson is, or at least he hasn’t been in recent years. 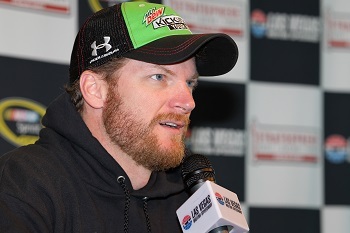 But Earnhardt does have a win already in 2014, something Johnson can’t claim. So when you get right down to it, at this point in time, Earnhardt is more assured of a Chase spot that Johnson. But my real reason for picking Earnhardt? I think I’ve mentioned this here before, but if this new Chase system had been implemented a year earlier, Earnhardt would have managed to squeak through each round, despite being winless last year, and would’ve been the 2013 Sprint Cup champion. And he’s off to an even better start this year than last. Tony Stewart: As long as Stewart can pull off a win or two between now and the Chase cutoff at Richmond (Va.) International Raceway in September, he’s sure to do well with this new Chase format, if past trends are any indication. Fall is the time when Stewart is at his best. He often gets off to somewhat of a slow start, but come September, he often shines. These assumed wins will be just what the doctor ordered to advance from round to round once the Chase gets underway. Of course, he does have to get in first. You have to be in it to win it, as they say. Okay, so I’ve picked three Chevrolet drivers with my first three picks. Surely, the manufacturer won’t completely dominate the NASCAR Final Four, so I guess I need to pick a Toyota or Ford driver to round out this final field of four. Denny Hamlin: To say Hamlin had a disappointing year in 2013 would be an understatement. After being sidelined for several races by a back injury early on in 2013, it seemed to take him most of the remainder of the season after his return to get his mojo back. He finally did get it back last November in the form of a win at Homestead-Miami. 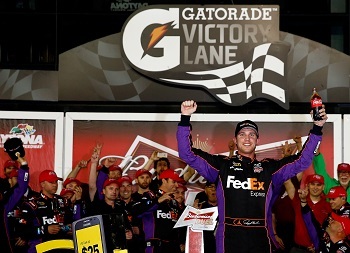 Like two of my other three picks, Hamlin is still winless, six races in, at least as far as points races go, but he does seem to look more like the Hamlin of old than the Hamlin of 2013. Remember him, the championship contender? 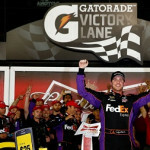 If you don’t rewind your mind back to the February Sprint Unlimited and the Budweiser Duel races. Okay, at the risk of you getting tired of my Kentucky basketball references, Kentucky won it all in 2012, but was relegated to the NIT where a first-round loss was suffered in 2013. But here the Wildcats are, back in the Final Four again. The same could happen for Hamlin. Does it seem odd that I only picked one of the six drivers already with wins this season? It’s still early. Who are your picks to still be racing for a title when the season winds down in November? We want to know. Follow on Twitter @AutoRacingDaily or “like” us on Facebook (facebook.com/autorcngdaily). Amanda’s also on Twitter @NASCARexaminer and has a fan/like page on Facebook: NASCAR Examiner. Good luck to all the drivers. And go Big Blue!